BE’ER SHEVA, Israel, June 3, 2016 – Morphisec, a provider of Moving Target Defense (MTD) endpoint threat prevention solutions, today announced it has been named a top startup to watch in Startup50’s Big 50-2016 report, an annual roundup of the top tech startups of the year. To earn a spot in the Big 50, startups must demonstrate viability through a series of increasingly rigorous questionnaires, tests and challenges. Startups from previous Big 50’s have raised record levels of funding (such as Cloudera’s near billion-dollar investment from Intel), have been acquired by major incumbents (HP’s acquisition of Eucalyptus), and have achieved successful IPOs (Square in 2015). CISOs wanting to learn more about how Morphisec’s Moving Target Defense technology can help them stay ahead of the competition should visit www.morphisec.com, schedule a demo, or contact Morphisec at info@morphisec.com or 617-209-2552. Jeff Vance founded Startup50 in 2014 in order to establish a hype-free zone and to start repairing the broken relationship between journalists, marketing/PR, and the startups themselves. Prior to founding Startup50, Jeff regularly contributed features stories to  Forbes.com, Network World, CIO, Wired, and many others. 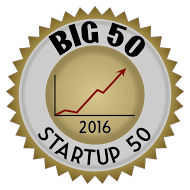 The Big 50 is Jeff’s yearly roundup of the hottest 50 startups to watch. These are startups that have all gone through Startup50’s rigorous vetting process and that represent the technologies, market sectors, and trends that are poised to challenge the status quo in the coming year and beyond. Emerging from Israel’s national cybersecurity center, Morphisec makes endpoint threat prevention viable again. Morphisec’s Endpoint Threat Prevention solution terminates the kill chain at its very onset, stopping and neutralizing zero-days advanced attacks and web-borne exploits before they can do any damage. It’s Moving Target Defense technology morphs the runtime environment, randomly and without any trace, concealing unpatched endpoint vulnerabilities and trapping all attempts at access. Attackers never find the targets they seek. Ever.